In order for someone to become a savior, there has to be a danger, a conflict, something bad from which the savior can get you out. Some situations are beyond your control, you are drowning and someone pulls you out. Your car is catching on fire and you cannot free yourself, then someone comes along and get you out right before the car exploded. You will always be indebted to that person who saved you or rescue you. During this time, every year, we celebrate Christmas and even though it has been so commercialized, some of us try our best to make it about the birth of the Savior, Jesus Christ. God announced through the prophets that he would be sending the Messiah who will become the savior of the world. God announced this news to shepherds while they were tending their sheep. (v.11) Today in the town of David (Bethlehem) a Savior has been born to you; he is Messiah the Lord. Right here the angel announced who the savior would be. Christ the Lord. The baby in a manger, whom the shepherds went to see would become the Savior of the world. (News of great joy for all people v.10) As a baby Jesus could not save anyone, in order for him to save the world, he must die like the hero who sacrifices himself so that others can live. Sin really makes us antagonist in this story. This is the role we really know how to play, to go against God’s command, his authority. We want his blessings but don’t want to play by his rule, by his book. We have run away from God, lost in the world and don’t even know. This is why you and I need a Savior like Jesus, it’s only through this sacrifice, through his death that you can be declared righteous before God, free from accusations. This is great news. 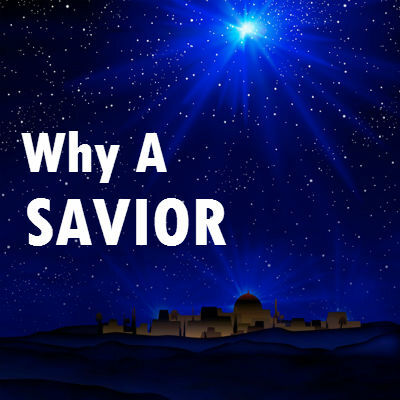 Why a savior? Because you and I have been playing the antagonist role for a while, and if you keep on playing it, you will lose at the end, the Savior came to change our role, so that at the end we end up winning. That is why you and I need a Savior like Jesus who sacrificed himself to change our status with God, to change the part we play in the redemption story. Without Jesus there is only judgment and condemnation. Stop being the antagonist in this story, God wants to make you the protagonist, but you must choose Jesus in order for you to win at the end. Thank God for Saving us!